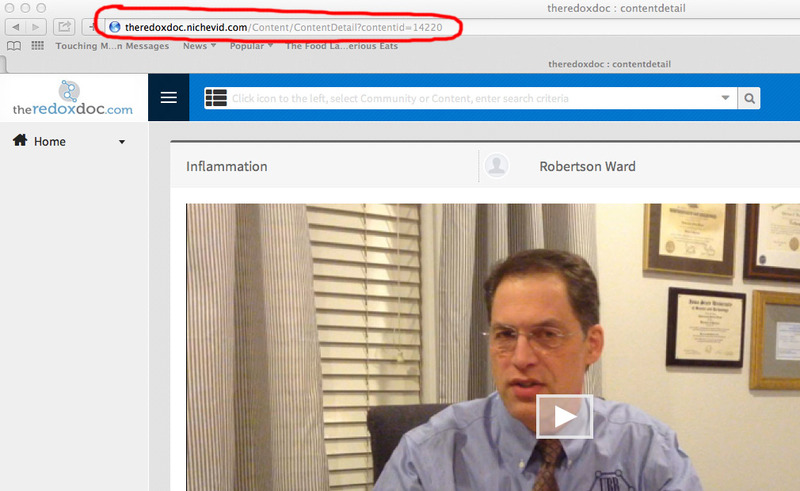 Dr. Ward will be producing several new video courses per month discussing health topics related to Redox Signaling. The cost for subscription is only $4.95 per month and gives you access to all videos, and you will be notified of all new releases. The subscription service allows UNLIMITED viewing of all of the subscription videos. Your subscription also gives you the ability to send a link for a one time viewing of a video of your choice to a person you’d like to introduce to the science. Click the link below to subscribe to the RedoxDoc Video Courses and to be notified of all new releases. NOTE: After completing your PayPal transaction the following screen will appear. This will correctly complete your registration, and take you directly to the videos. Sharing videos with friends by giving them the opportunity for a one time view registration is a great opportunity to share Redox Signaling science as well as allow them to view other videos on a one time basis. To share a particular video that you like, you need to share the link to the “single view” version of that video. With your subscription you will have access to every video in the library in both “Subscription Community” and “Single View Community”. NOTE: As a subscriber, you will be able to view all of the “subscription videos” as much as you like, but the single view videos are set to be viewed only once. That is the way they are supposed to work. You can still click on each video, look at the url at the top (see the image below) and cut and paste that to send to a colleague. You may see a warning telling you you’ve exceeded the view limits of that particular video, but you can still send the link. YOU CAN WATCH THE MATCHING SUBSCRIPTION VIEW OF THAT VIDEO AS MUCH AS YOU LIKE. The Single View Community videos are the videos that are intended to be shared. Here’s how to locate and share a Single View video: The diagram below represents your first view after you subscribe. You must add the “Single View” videos to your collection or “community”. Click on the “Show More” link at the top right. To add that content to your video collection, simply click the “Subscribe to” link at the top right (circled above) Those videos will now become part of your collection. They will be clearly labeled “Single View Community” for your convenience. Click your ‘HOME’ link on the left. There you should see both sets of videos now in your home screen. NOTE: If a Single View video says you are BLOCKED. Don’t worry. You can still share the video. You can view your Subscriber version of each video as many times as you like. The single view videos will not be blocked for a person you share video links with. And the link you share will give them access to view the other videos one time only. When the recipient clicks the link you send, or pastes it into their browser, they will be guided through a simple registration process, and be allowed to view that video. They will also be able to view other RedoxDoc Video Curriculum videos one time each. The good news is that as new videos are added, you can share them with the same friend and they can log in and view the new videos without registering again.